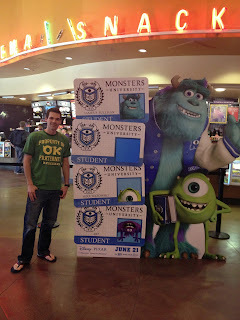 Here's me at the College Advanced screening of MU in Salt Lake City! The Oozma Kappa shirt was my first piece of Monsters University merch. It was released just in time and I was able to stop at the Disney Store right before heading to the screening...it was perfect! You can find these currently at the Disney Store. UPDATE: I now have a mini toddler size version of this same shirt, see post HERE. It's be fun to match with my little boy someday!